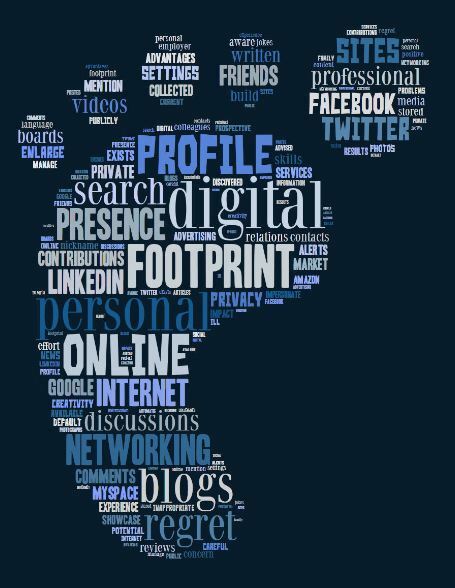 Digital Footprint – This is pretty much exactly what you’d imagine it to be, an indelible and permanent digital impression that exists on the Internet that represents you and your company. The mere mention of the word “permanent” should be enough to warrant your pro-active participation in the management of your digital footprint. Unfortunately, for most businesses there is little understanding and many choose to remain ignorant about the importance of a strong and well managed digital footprint. It’s probably a safe assumption that most small businesses are at least starting to realize the importance of managing their web presence. Once a mere buzzword, social media has settled nicely into an accepted norm of doing business online. Search engine optimization (SEO) is no longer thought of as an event based practice, but as an ongoing and fluid best practice. Blogging as a way to establish authority and to form more lasting and solid relationships with customers and would be customers is not as feared as it once was. Altogether, these tactics and disciplines form the imprint that make up your digital footprint. Participating on different and relevant social networks is good…taking control of your story and your client-facing content is also good. Being proactive online is widely accepted and for the most part, business owners understand that without it they fall behind competitors. If being progressive and innovative is a must for your business, then lack of participation is no longer an option. I think that what many people fail to realize is that their digital footprint is made up of MANY different parts, and that many of these pieces fall outside of any proactive behavior and good intentions one might cast in the absolute right direction. Also a safe assumption is that businesses put their best foot forward and that any part of their created digital footprint will leave a good impression on those who find you while searching the web for products and services. But what about what others might say about you online? This too occupies the same space as all that you have done proactively and with a positive slant. I’m talking about review sites like Yelp, Trip Advisor, Angie’s List, Google+, and literally dozens more. While much of what is being said about you may be positive and quite supportive, sometimes what is said is far from the savory morsel that you might hope a prospective client might happen upon. I’m talking about that part of your digital footprint and your online reputation that falls outside of your control. I’d bet that this is something that you have considered at length and that you are avoiding the topic out of fear if nothing else. After all, if we’re going to play the game, we’d all like to be in control and not at the mercy of people we don’t know and can’t control. If this post is resonating with you, then it’s probably a good time to talk about reputation management. Ignoring reputation management is fast becoming a non-option for most small businesses in today’s online environment. Just because you refuse to acknowledge that Yelp exists won’t stop people from leaving reviews there about your business. Furthermore, if you don’t claim and take control of your businesses profile on sites like Yelp, the basic information on the profile may not even be correct. If there are in fact some negative reviews and you are unaware of them, then these publically visible comments go completely unanswered and unchecked by you…and the public sees this. Think about that, the review sites are highly regarded and show up very high in search results. It is a VERY good possibility that a review site may be the front door to your business and the first impression that many internet searches will find as they do their homework (You do know that more people than not actually research goods and services online prior to buying than ever before, right?) before they spend their money. Let’s consider that bad review…just sitting there…week after week, month after month. How many people do you think it will impact? Consider the same bad review with a response from you, something along the lines of “I’m terribly sorry that you had a bad experience at our establishment. My name is James and I am the owner here. I want to assure you that this is absolutely not the norm here at our establishment and we strive to deliver excellence at all times. My personal email/number is me@me.com 800-555-1212. I would appreciate it if you would contact me directly as I welcome the opportunity to learn how we can better serve our patrons. Your insight and opinion are very valuable to us here at our establishment. I look forward to hearing from you soon.” Now, how many people do you think that will impact? You see, the choice to be proactive is still yours. I should also state that in most cases, these unhappy customers often become some of the strongest advocates for the business that reaches out and makes contact. Oftentimes they also add an amendment to their original bad review. The public sees this. Taking control of your reputation management is like many things before it that you’ve decided to embrace. It will take time and energy and you’ll have to get involved to get past the minimal learning curve of navigating the review sites. There are profiles to claim and/or create, information and bios need to be created, and you’ll need to monitor the most important of these sites that are the most relevant to your business. In the online world today this is the price we pay to stay ahead. There are any number of sites, products, and services available to you that are designed to monitor your online reputation. Most are fairly affordable and do a decent job to aid you as you undertake reputation management for your business. For those of you who are TrustWorkz® clients, we have some good news. We now provide reputation management as a service and an added value to our clients. We will monitor the review sites and notify you of any negative reviews. We will also suggest an appropriate response and guide you through the process of replying. We’ll even handle the response for you if you so desire.